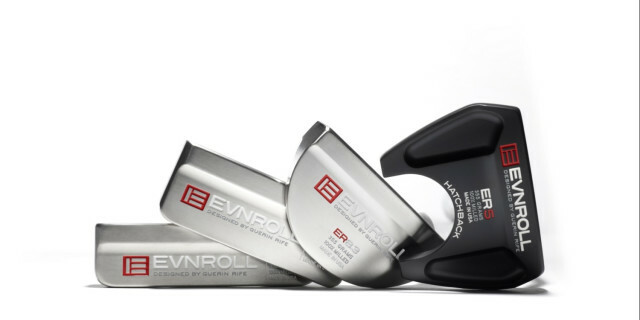 Evnroll Putters has added four new models to its impressive range, which first made a breakthrough in 2016, delivering an innovative mill pattern through Guerin Rife's "Sweet Face" that was designed to create uniform performance across the hitting area of the face, technology that saw the brand win a series of awards. In addition to the new putters, the TourStroke Trainer has also been revealed, which has been introduced to hone the perfect stroke path, as well as the Gravity Grip to promote a square face impact angle. ER2.2 is a new plumber-neck version of the extremely popular ER2 MidBlade, with the heel-side mass reduced to allow for the extra weight of the hosel arm to keep the sweet spot in front of the centre sightline. The ER5B is a new all-black version of the popular Hatchback mallet featuring a proprietary flat black armour finish, complete with black shaft, grip, and headcover. It also incorporates a low heel bend, which creates more toe hang to guard against pulled putts. The TourStroke can also be used in player mode by placing the putter face directly behind the ball so that the shaft is in line with the front of the ball. This automatically creates forward press without leaning the shaft forward and pre-sets the right wrist to promote a simple one-piece rocking of the shoulders. Used as a gamer it delivers the same benefits as the new ER1TS model. This new, deep V-shaped grip incorporates an ultra-light 35-gram EVA foam body with a 70 gram 9” steel rod that runs the length of its extreme lower section. Moving twice the grip's structure weight directly below and ½” away from the shaft allows the hands to feel and maintain a square putter face through the entire hitting area, virtually eliminating face rotation at impact.